The grand shopping centre in Hyllie was completed at the end of 2012. Emporia is perfectly situated in the southwestern part of Malmö, close to the Malmö Arena and the City Tunnel station. For one of Scandinavia's largest shopping centres with an area of approximately 93,000 m², it was crucial that the video surveillance system should be user-friendly and effective, maintaining highest quality. Kentima’s Ethiris® Video Management Software was selected to fulfill these requirements. The grand shopping centre in Hyllie was completed at the end of 2012. Emporia is perfectly situated in the southwestern part of Malmö, close to the Malmö Arena and the City Tunnel station. For one of Scandinavia's largest shopping centres with an area of approximately 93,000 m², it was crucial that the video surveillance system should be user-friendly and effective, maintaining highest quality. Kentima’s Ethiris Video Management Software was selected to fulfill these requirements. 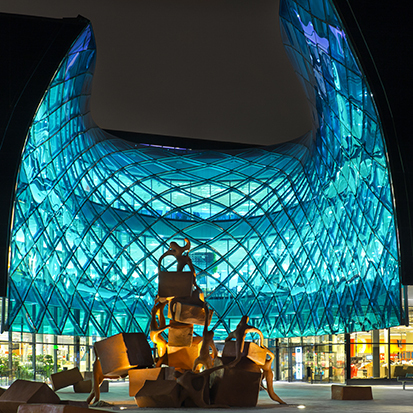 - Emporia covers an area of 93,000 m2, making it one of Scandinavia's largest shopping centres. - Approximately 130 cameras are connected to Ethiris, which monitors the shopping centre around the clock. - Ethiris has several smart search functions that make it easy to find video material related to a specific incident. Ethiris is a powerful software application for video surveillance that monitors the shopping centre using about 130 cameras. Ethiris is primarily intended as an aid in the event of an evacuation situation. Using Ethiris, personnel can quickly monitor emergency exits for example, to ensure that everyone has safely left the building. One of Ethiris' most-valued functions is the easy-to-use search function. The emphasis has always been on it being a user-friendly surveillance system and that there should be smart search functions to quickly find video material related to a specific incident. “User-friendliness and quality were important factors in the choice of surveillance system,” says Roger Olsson, Property Manager, Steen & Ström Sweden AB. The operators are very satisfied with Ethiris and perceive the system as user-friendly and that the functionality has been adapted to suit their everyday duties. The surveillance system has several fast and advanced search functions that save time for the operators. For video surveillance of the shopping centre, it is important with good image quality. It is not enough to have high resolution cameras if the surveillance system is incapable of fully utilising the quality of the cameras. Ethiris can handle all available resolutions produced by the cameras. “Ethiris' scalability made it easy to adapt the functionality to Emporia's needs,” says Magnus Leonardsson, Project Manager, Skanska Installation AB. Skanska Installation, which performed the installation at Emporia, is also very pleased with Kentima's surveillance system. Ethiris is fast, recorded material is quickly loaded and the capability to simultaneously attain an overview with many cameras are just some of the reasons why Skanska Installation recommends and chooses Ethiris.